Superficial inflammatory dermatoses are very common and comprise a wide, complex variety of clinical conditions. Accurate histological diagnosis, although it can sometimes be difficult to establish, is essential for clinical management. Knowledge of the microanatomy of the skin is important to recognise the variable histological patterns of inflammatory skin diseases. This article reviews the non-vesiculobullous/pustular inflammatory superficial dermatoses based on the compartmental microanatomy of the skin. The histological diagnosis of cutaneous inflammatory diseases can be confusing, even for the most experienced pathologist. This is because the immune system within the skin has limited ways in which it reacts and responds to an antigenic stimulus, and many inflammatory diseases do not show specific histological features. In view of this complexity and commonality, histological patterns of recognition are beneficial for the rapid development of a differential diagnosis. This can be achievable by being familiar with the microanatomy of the skin and its regional variations, in addition to the basic structural alterations that can occur in different pathological conditions. This review is oriented towards the recognition of the histological patterns seen in non-vesiculobullous/pustular inflammatory superficial dermatoses that involve the epidermis and papillary dermis, using a schematic approach. The first compartment/unit includes the epidermis, papillary dermis, and superficial vascular plexus. These structures are inter-related and mutual. The second compartment/unit consists of the reticular dermis and the deep vascular plexus. The third compartment/unit consists of the pilosebaceous units, the eccrine glands, and in certain anatomical locations, the apocrine glands. The fourth compartment/unit is the subcutaneous tissue (panniculum). Although using a compartmental approach to establish the reaction pattern facilitates the diagnosis of inflammatory skin diseases, there are limitations to this approach. The size of the skin biopsy should be adequate and representative of all four compartments and should also include hair follicles. A 2 mm punch biopsy is too small to represent all compartments, and often insufficient to demonstrate a recognisable pattern. A 4 mm punch biopsy is preferred, and usually adequate for the histological evaluation of most inflammatory dermatoses. However, a larger biopsy (6 mm punch biopsy), or even an incisional biopsy, might be necessary in panniculitis or cutaneous lymphoproliferative disorders. A superficial or shave biopsy should be avoided, because it might be misleading, producing an erroneous pattern and diagnosis. In the histological evaluation of skin for inflammatory dermatoses, a clinicopathological correlation is essential, and plays an important role in achieving the diagnosis. The patient’s age and relevant clinical history, in addition to the site from which the skin biopsy was obtained, should be provided to the pathologist. After proper fixation and processing, three deeper haematoxylin and eosin stained sections and one section stained with periodic acid Schiff (PAS) for evaluation of the epidermal basement membrane, blood vessels, and the presence of fungal organisms are considered sufficient for microscopic evaluation. The need for deeper sections and special stains varies from one case to another, and additional tasks can be ordered when necessary. Special stains that might be beneficial in establishing a diagnosis of inflammatory dermatoses include Martius-Scarlet blue stain for fibrin, colloidal iron Hale’s for acid mucin, Prussian blue for iron, toluidine blue for mast cells, Fontana Masson for melanin pigment, elastic stain for perforating disorders and demonstration of elastic tissue, Von Kossa for calcium deposits, and Congo red for amyloid. Gram stain and Gomori methenamine silver stain can be helpful in demonstrating bacterial and fungal microorganisms, respectively. Immunohistochemistry has a limited role, although it can be useful in certain clinical conditions, such as characterising the neoplastic CD4+ T cell population in mycosis fungoides and the CD4+ and CD8+ T cell populations in patients with human immunodeficiency disorder (HIV). It is worthwhile mentioning that the CD8+ T cell population is the predominant subtype in HIV dermatoses. Immunofluorescence studies have an essential role in diagnosing immunologically related inflammatory skin diseases, specifically vesiculo-bullous diseases and vasculitis. Electron microscopy is of limited value, but may be helpful in certain vesiculo-bullous diseases, mycosis fungoides, and Langerhans cell histiocytosis. Most common superficial inflammatory dermatoses involve the first compartment/unit of the skin. The most common pattern of reaction encountered is the superficial perivascular inflammatory infiltrate. A transient inflammatory stimulus results in slight hyperaemia and a mild perivascular lymphocytic infiltrate. If the stimulus persists, interstitial oedema and endothelial swelling develop. With further stimulation, involvement of the overlying epidermis occurs. Inflammatory dermatoses involving the first compartment of the skin are divided into three main categories (fig 1): (1) non-vesiculobullous/pustular lesions, (2) pustular dermatoses, and (3) vesiculo-bullous lesions. The non-vesiculobullous/pustular lesions, the focus of this review, are divided into two categories based on the presence or absence of epidermal changes. 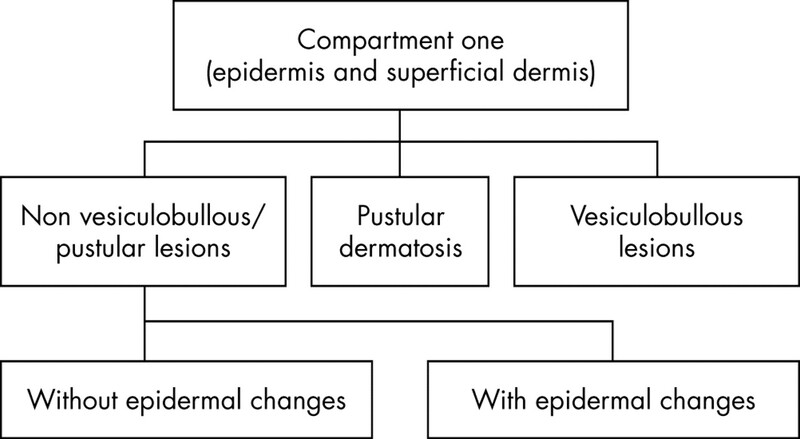 When epidermal changes are present, they are further subdivided into spongiotic dermatitis, interface dermatitis, and psoriasiform dermatitis (fig 2). Classification of the inflammatory dermatoses involving the first compartment. 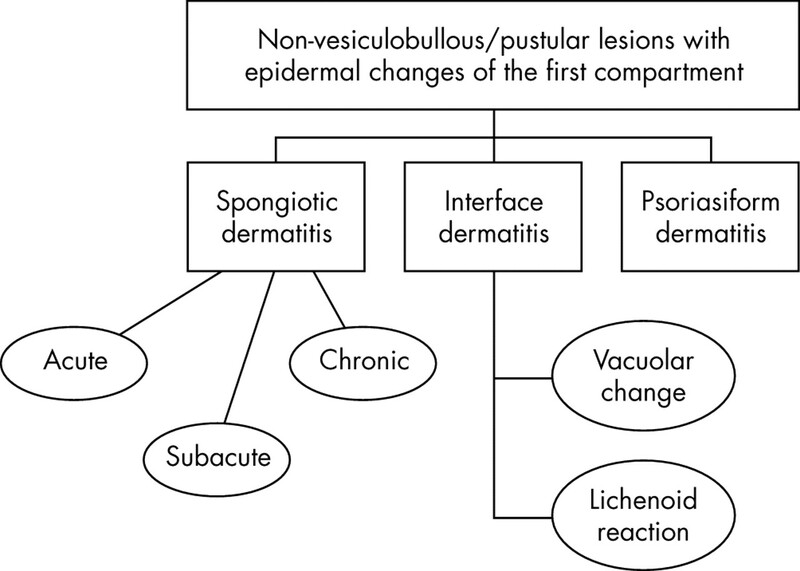 Types of non-vesiculobullous/pustular lesions with epidermal changes. The inflammatory skin dermatoses without epidermal changes are manifested histologically by a superficial perivascular inflammatory infiltrate (PVI). This reactive pattern is induced by many conditions. The type of inflammatory cell infiltrate is different from one condition to another, allowing further subclassification of the PVI into six groups (table 1). This is the most common type of PVI. Many conditions can result in a lymphocytic PVI. Common causes are immunological and non-immunological cutaneous drug eruption1–4—particularly secondary to antibacterials5–7 (fig 3), urticarial reactions,8,9 viral exanthema, infestation, and insect bites. Other less common conditions are fungal infections, pigmented purpuric dermatoses,10–12 erythema annulare centrifugum,13,14 and other gyrate erythemas. Drug induced perivascular lymphocytic inflammatory cell infiltrate. (A, B) Drug induced perivascular lymphoeosinophilic inflammatory infiltrate and interface change. (A) Insect bite with pronounced oedema in the papillary dermis. (B) Lymphoeosinophilic inflammatory infiltrate induced by spider bite. Nuclear debris and dermal necrosis are present. A prominent plasma cell component of the inflammatory infiltrate may be seen adjacent to an area of trauma, ulceration, or scar. It is also seen in cases of rosacea, secondary syphilis, and erythema chronicum migrans, which is pathognomonic of Lyme’s disease.19 The patch stage of Kaposi’s sarcoma may be associated with increased plasmacytic cell infiltration.20 Occasionally, early cutaneous connective tissue diseases can be associated with an increased plasma cell population. It is worth mentioning that relatively larger numbers of plasma cells are usually present in the mucosal biopsies and may be non-specific. Mastocytosis is a rare disease characterised by primary pathological accumulation of excessive numbers of mast cells in different tissues.21 Urticaria pigmentosa is the most common form of cutaneous mastocytosis.22,23 The mast cells are present in the interstium and around the superficial vascular channels, and some of the mast cells show degranulation. A toluidine blue stain is usually used to demonstrate mast cells. This is the most confusing type of PVI. Conditions that are associated with a lymphohistiocytic inflammatory cell infiltrate include drug reactions, viral infections and post-viral reactions, HIV dermatoses, and leprosy24,25 (fig 6). Ziel-Neelsen, acid fast bacilli, Gomori methenamine silver, PAS, and Fite stains should be performed on all inflammatory dermatoses with a prominent lymphohistiocytic infiltrate to exclude the presence of microorganisms. 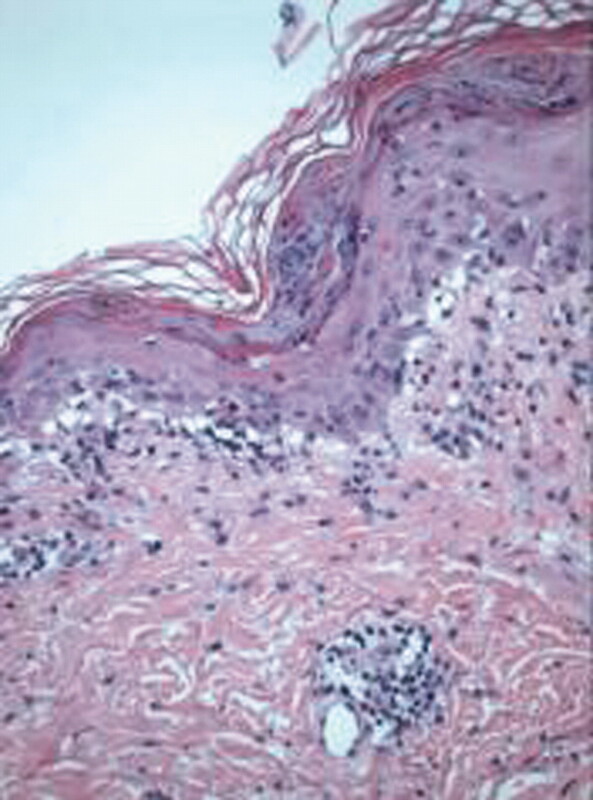 A prominent perivascular neutrophilic inflammatory cell infiltrate can be associated with neutrophilic urticarial reactions (fig 7A), dermatitis herpetiformis, early IgA dermatosis, early Sweet’s syndrome,26–28 early connective tissue disorders such as lupus erythematosus, early herpetic infection, and acute generalised exanthematous pustulosis29,30 (fig 7 B). The last three conditions are usually associated with epidermal changes. Leucocytoclastic vasculitis should be ruled out in all cases of neutrophilic dermatosis31 (fig 7C). The examination of multiple haematoxylin and eosin stained deeper sections is helpful. (A) A neutrophilic urticarial reaction. (B) Acute generalised exanthematous pustulosis. (C) A neutrophilic infiltrate, nuclear debris, and fibrinoid necrosis characteristic of leucocytoclastic vasculitis. The inflammatory dermatoses with epidermal changes are classified histologically into spongiotic dermatitis, interface dermatitis, and psoriasiform dermatitis. Spongiotic dermatitis is further subclassified into acute, subacute, and chronic, depending on the histological features and the time the biopsy was performed. This shows a variable degree of epidermal spongiosis and vesicle formation; the vesicles are filled with proteinaceous fluid containing lymphocytes and histiocytes (fig 8A). Superficial dermal oedema with a perivascular lymphocytic inflammatory cell infiltrate is usually present. Exocytosis of the inflammatory cells is present, and there is no acanthosis or parakeratosis. In allergic/contact dermatitis and atopic dermatitis, eosinophils may be present in the dermis and epidermis (eosinophilic spongiosis). (A) Epidermal spongiosis and intraepidermal vesicular formation in acute spongiotic dermatitis. (B, C) Moderate inflammatory cell exocytosis in subacute spongiotic dermatitis. (D) Chronic spongiotic dermatitis showing irregular acanthosis, hyperkeratosis, and parakeratosis. This is the most frequently encountered type of spongiotic dermatitis. The degree of spongiosis and exocytosis of the inflammatory cells is mild to moderate, and compared with acute spongiotic dermatitis there is irregular acanthosis and parakeratosis. 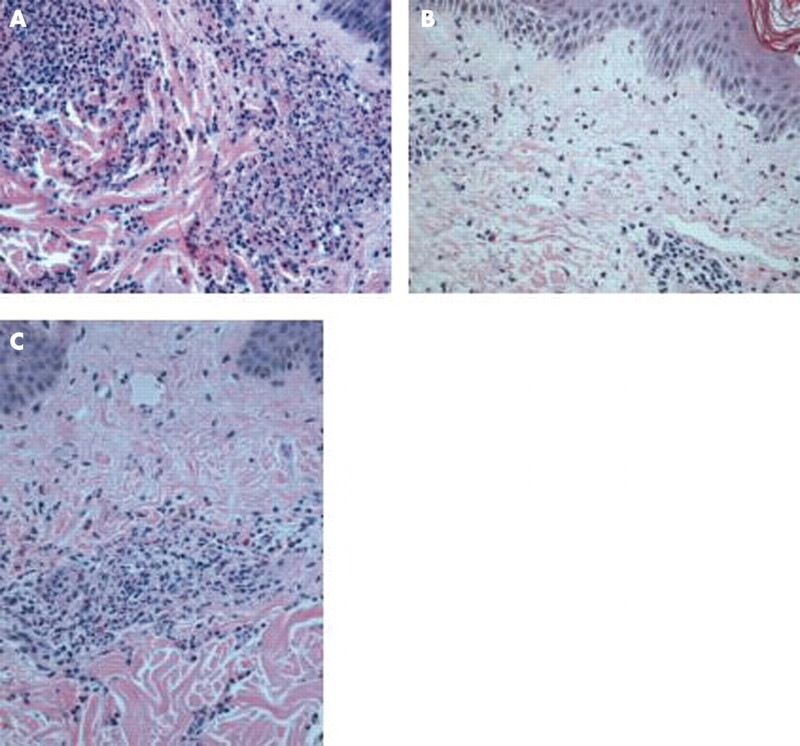 A superficial dermal perivascular lymphohistiocytic inflammatory infiltrate, swelling of the endothelial cells, and papillary dermal oedema are present (fig 8B, C). The spongiosis is mild to absent but there is pronounced irregular acanthosis, hyperkeratosis, and parakeratosis (fig 8D). Minimal dermal inflammation and exocytosis of the inflammatory cells are present. 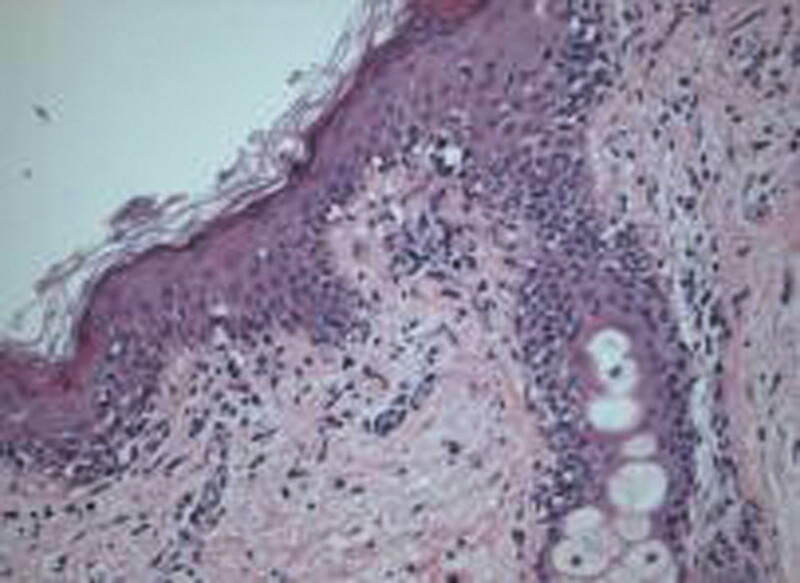 Fibrosis of the papillary dermis may be present. The PAS stain is essential to exclude fungal infection. All three histological subtypes of spongiotic dermatitis can be caused by various clinical conditions. The microscopic features of the chronicity of the lesion depend largely on the time of biopsy and the clinical course of the lesion. The role of the pathologist is to recognise the histological features of spongiotic dermatitis. However, a clinical correlation is crucial for a definitive diagnosis. 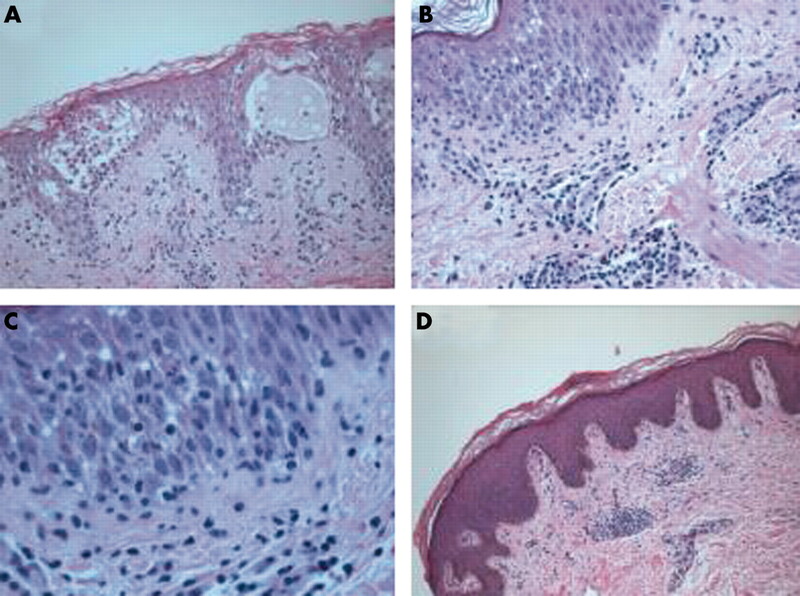 This is histologically classified into two categories: (a) interface dermatitis with vacuolar change, and (b) interface dermatitis with lichenoid inflammation (fig 2). Each category has distinctive morphological features, and is caused by various clinical conditions (table 2). This pattern of inflammatory dermatosis is characterised by the presence of a mild inflammatory cell infiltrate along the dermoepidermal junction, with vacuolar change within the basal keratinocytes. Individual necrotic, predominantly basal, keratinocytes are frequently seen because the inflammatory process causes injury to the basal keratinocytes (colloid or Civatte bodies). Numerous clinical conditions can result in vacuolar alteration of the basal keratinocytes, including: viral exanthems, phototoxic dermatitis, acute radiation dermatitis, erythema dyschromicum perstans,37 lichen sclerosis et atrophicus,38 erythema multiforme and Stevens-Johnson syndrome,39,40 erythema multiforme-like drug eruption (fig 9), and fixed drug eruption.41 Vacuolar alteration is often present in cutaneous connective tissue disorders such as lupus erythematosus42,43 (fig 10A–D), and dermatomyositis.44 Acute cutaneous graft versus host disease (GVHD) (table 3) characteristically shows vacuolar alteration (fig 11), which ranges in severity from focal or diffuse vacuolation of the basal keratinocytes (grade I), to separation at the dermoepidermal junction (grade III).45 Drug reactions can be difficult to differentiate from acute GVHD based on morphological appearances. The presence of an eosinophilic inflammatory component favours a drug reaction, whereas involvement of the hair follicles is in keeping with acute GVHD. The clinical history is essential to distinguish between these two entities. Interface dermatitis with vacuolar alteration caused by erythema multiforme-like drug eruption. Note the presence of single dyskeratotic cells in the epidermis. Systemic lupus erythematosus (SLE). (A, B) Interface dermatitis with vacuolar alteration. (C) Colloidal iron Hale’s stain demonstrates abundant dermal mucin, often found in SLE. (D) Thickened dermo–epidermal junction basement membrane highlighted by the periodic acid Schiff stain. Acute cutaneous graft versus host disease, grade II. The vacuolar change involves the dermo–epidermal junction basement membrane and extends to the hair follicle. 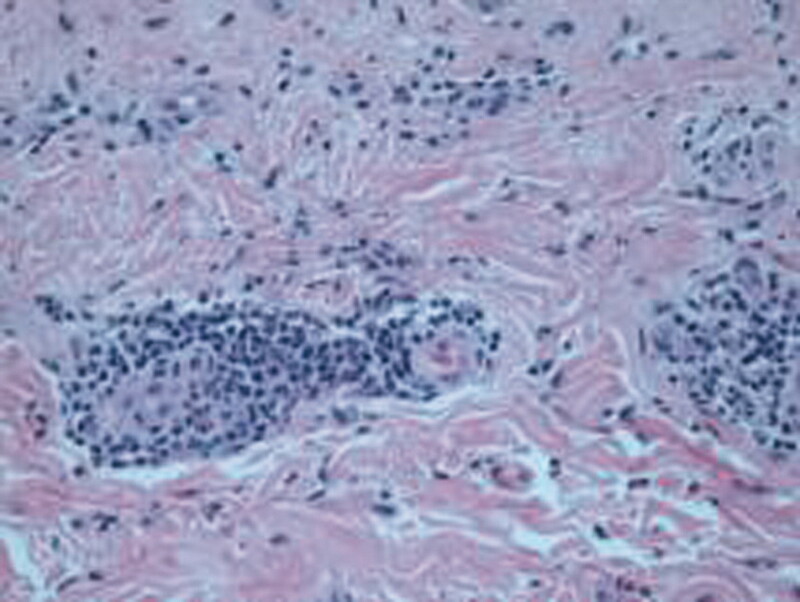 Scattered necrotic keratinocytes are present in the epidermis. This is another pattern of cutaneous inflammatory reaction, which is characterised by a confluent, band-like, dense accumulation of inflammatory cells in the papillary dermis, mainly consisting of small lymphocytes and a few histiocytes along or hugging the dermo–epidermal junction. The lichenoid reaction is often accompanied by vacuolar degeneration of the basal keratinocytes and the presence of apoptotic bodies (colloid or Civatte bodies). Many clinical conditions can result in the lichenoid alteration. These include lichen planus46 (fig 12), lichen planus-like keratosis,46,47 lichenoid actinic keratosis, lichenoid drug eruption, lichenoid lupus erythematosus, lichenoid GVHD (chronic GVHD),48 lichen nitidus,49 pigmented purpuric dermatosis,10–12 lichen amyloidosus,50 pityriasis rosea,36 and pityriasis lichenoides chronica.51,52 Other unusual conditions that can be associated with a lichenoid inflammatory cell infiltrate are HIV dermatitis,53 syphilis, mycosis fungoides,54,55 urticaria pigmentosa,22,23 and post-inflammatory hyperpigmentation.56,57 In cases of post-inflammatory hyperpigmentation, care should be taken not to miss the diagnosis of a mimic, such as regressed melanocytic lesion or lichenoid pigmented actinic keratosis. A detailed and appropriate clinical history is essential for the accurate diagnosis of interface dermatitis. 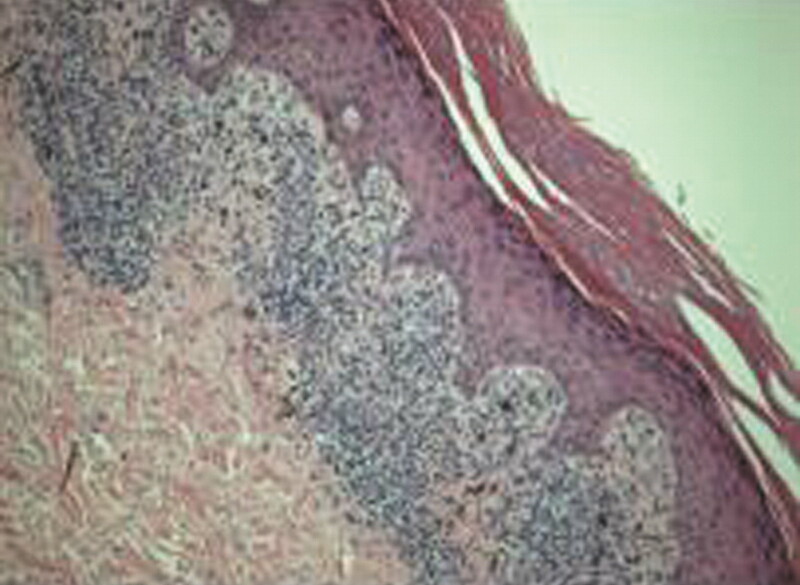 This type of inflammatory dermatosis is characterised by the presence of regular epidermal hyperplasia, elongation of the rete ridges, hyperkeratosis, and parakeratosis. Thinning of the portion of the epidermal cell layer that overlies the tips of dermal papillae (suprapapillary plates), and dilated, tortuous blood vessels within these papillae are often present. A superficial perivascular inflammatory cell infiltrate is usually encountered. Numerous conditions can result in psoriasiform dermatitis. These include psoriasis58 (fig 13), seborrheic dermatitis, psoriasiform drug eruption, chronic fungal infections, lichen simplex chronicus, chronic spongiotic dermatitis, secondary syphilis, pellagra59 and other nutritional deficiencies, and pityriasis rubra pilaris.60,61 Pityriasis lichenoides chronica,51,52 acrodermatitis enteropathica,62 inflammatory linear verrucous epidermal naevus,63 and rarely subacute psoriasiform cutaneous lupus erythematosus are also associated with psoriasiform dermatitis. Psoriasis. (A) Note the lack of the granular cell layer. (B) Neutrophilic inflammatory infiltrate into the acanthotic epidermis. A systemic approach is important for pathological diagnosis when evaluating skin psoriasiform dermatites. Examining multiple deeper levels is recommended if the histological features in the initial cuts do not correlate well with the clinical history. 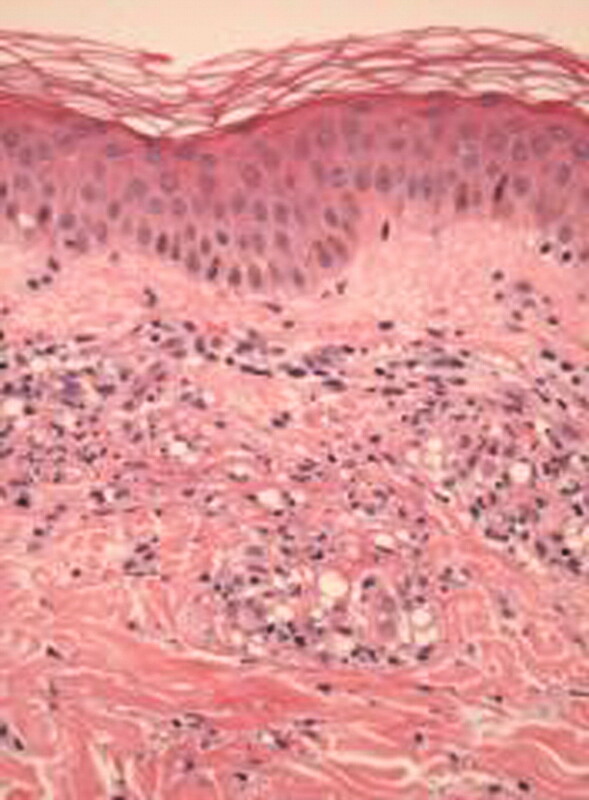 Recognising various histological alterations in the epidermal layers can help in narrowing down the differential diagnosis of psoriasiform dermatitis. Agranulosis or hyporgranulosis of the epidermis is a feature of psoriasis. However, in partially treated psoriasis, the granular cell layer may be present, so that clinical–pathological correlation is crucial for accurate diagnosis. An increase in the intensity of the granular cell layer is associated with lichen simplex chronicus. Different alterations that occur within the spinous layer are associated with various clinical conditions (table 6). The microscopic findings of seborrheic dermatitis often show features of both spongiform and psoriasiform changes. Evaluation of the dermoepidermal junction and dermis is important. Psoriasiform dermatitis with interface changes can be seen in drug reactions, cutaneous lupus erythematosus, and syphilis. This is an interesting and unique finding and may be confusing to the pathologist. Under these circumstances, it is suggested that multiple deeper levels should be examined. The PAS stain is important to examine the integrity of the basement membrane. Colloidal iron stain for acid mucin (Hale’s stain) may be necessary because mucin might be present in cases of lupus erythematosus. The presence of superficial dermal atypical mononuclear cells with epidermotropism and Pautrier microabscesses is suggestive of mycosis fungoides. Recognising the type of superficial dermal perivascular inflammatory cell infiltrate is important, and can facilitate the diagnosis of psoriasiform dermatitis, because certain types of inflammatory cell infiltrate correspond to certain clinical conditions, as discussed previously. It is also worth mentioning that psoriasiform hyperplasia can be seen in reactive reparative epithelium after surgery, or trauma, with stasis changes (stasis dermatitis), and in certain dermal tumours such as benign cutaneous fibrous histiocytoma and granular cell tumour. Inflammatory skin diseases are complex and create a diagnostic challenge for the pathologist. Knowledge of the clinical information, microanatomy of the skin, and the biological behaviour of various inflammatory dermatoses, in addition the use of a systematic approach during histological evaluation, are essential to narrow the differential diagnosis, thereby achieving the most accurate and appropriate diagnosis. An effort should be made to distinguish and exclude various entities that may simulate inflammatory skin conditions. These entities include stasis dermatitis, dermal haemorrhage and reactive endothelial cells, early Kaposi’s sarcoma with abundant plasma cells, cryoglobulinaemia, and mycosis fungoides. Special stains and immunohistochemical stains should be applied as needed. Crowson AN, Magro CM. Recent advances in the pathology of cutaneous drug eruption. Dermatol Clin1999;17:537–60. Breathnach SM. Adverse cutaneous reactions to drugs. Clin Med2002;2:15–19. Crowson AN, Margo CM. The dermatopathology of drug eruption. Curr Probl Dermatol2002;14:117–46. Fitzpatrick J. The cutaneous histopathology of chemotherapeutic reactions. J Cutan Pathol1993;20:1–14. Bachot N, Roujeau JC. Differential diagnosis of severe cutaneous drug eruptions. Am J Clin Dermatol2003;4:561–72. Crowson AN, Magro CM. Antidepressant therapy: a possible cause of atypical cutaneous lymphoid hyperplasia. Arch Dermatol1995;131:925–9. Margo CM, Crowson AN. Drugs with antihistaminic properties as a cause of atypical cutaneous lymphoid infiltrate. J Am Acad Dermatol1995;32:419–28. Hurwitz RM, DeTranna C. The cutaneous pathology of atopic dermatitis. Am J Dermatopathol1990;12:544–51. Leung DY. Atopic dermatitis: the skin as a window into the pathogenesis of chronic allergic disease. J Allergy Clin Immunol1995;96:302–18. Price ML, Jones EW, Calnan CD, et al. Lichen aureus: a localized persistent form of pigmented purpuric dermatitis. Br J Dermatol 1985;112:307–14. Aoki M, Kawana S. Lichen aureus. Cutis2002;69:145–8. Sardana K, Sarkar R, Sehgal VN. Pigmented purpuric dermatoses: an overview. Int J Dermatol2004;43:482–8. Kim KJ, Chang SE, Choi JH, et al. Clinicopathologic analysis of 66 cases of erythema annulare centrifugum. J Dermatol 2002;29:61–7. Weyers W, Diaz-Casacajo C, Weyers I. Erythema annulare centrifugum: results of a clinicopathologic study of 73 patients. Am J Dermatopathol2003;25:451–62. Kory WP, Rico MJ, Gould E, et al. Dermatopathologic findings in patients with acquired immunodeficiency syndrome. South Med J 1987;80:1529–32. LeBoit PE. Dermatopathologic findings in patients infected with HIV. Dermatol Clin1992;10:59–71. Shornick JK. Dermatoses of pregnancy. Semin Cutan Med Surg1998;17:172–81. Al-faris SI, Jones SV, Black MM. The specific dermatoses of pregnancy: a re-appraisal. J Eur Acad Dermatol Venereol2001;15:197–206. Wu Y-S, Zhang W-F, Feng F-P, et al. Atypical cutaneous lesions of Lyme disease. Clin Exp Dermatol 1993;18:434–6. Tappero JW, Conant MA, Wolfe SF, et al. Kaposi’s sarcoma: epidemiology, pathogenesis, histology, clinical spectrum, staging criteria and therapy. J Am Acad Dermatol 1993;28:371–95. Hartmann K, Henz BM. Mastocytosis: recent advances in defining the disease. Br J Dermatol2001;144:682–95. Brockow K. Urticaria pigmentosa. Immunol Allergy Clin North Am2004;24:287–316. Wolff K, Komar M, Petzelbauer P. Clinical and histological aspects of cutaneous mastocytosis. Leuk Res2001;25:519–28. Abulafia J, Vignale RA. Leprosy: pathogenesis updated. Int J Dermatol1999;38:321–34. Naafs B. Current views on reactions in leprosy. Indian J Lepr2000;72:97–122. Fitzgerald RL, McBurney EI, Nesbitt LT. Sweet’s syndrome. Int J Dermatol1996;35:9–15. Callen JP. Neutrophilic dermatoses. Dermatol Clin2002;20:409–19. Cohen PR, Kurzrock R. Sweet’s syndrome revisited: a review of disease concept. Int J Dermatol2003;42:761–78. Roujeau JC, Bioulac-Sage P, Bourseau C, et al. Acute generalized exanthematous pustulosis. Analysis of 63 cases. Arch Dermatol 1991;127:1333–8. Roujeau JC. Neutrophilic drug eruptions. Clin Dermatol2000;18:331–7. Claudy A. Pathogenesis of leukocytoclastic vasculitis. Eur J Dermatol1998;8:75–9. Houck G, Saeed S, Stevens GL, et al. Eczema and the spongiotic dermatoses: a histologic and pathogenic update. Semin Cutan Med Surg 2004;23:39–45. Leung DY, Boguniewicz M, Howell MD, et al. New insights into atopic dermatitis. J Clin Invest 2004;113:651–7. Shuster S. Duct disruption, a new explanation of miliaria. Acta Derm Venereol1997;77:1–3. Smith KJ, Skelton H. Histopathologic features seen in Gianotti-Crosti syndrome secondary to Epstein-Barr virus. J Am Acad Dermatol2000;43:1076–9. Allen RA, Janniger CK, Schwartz RA. Pityriasis rosea. Cutis1995;56:198–202. Osswald SS, Proffer LH, Sartori CR. Erythema dyschromicum perstans: a case report and review. Cutis2001;68:25–8. Mihara Y, Mihara M, Hagari Y, et al. Lichen sclerosis et atrophicus. A histological, immunohistochemical and electron microscopy study. Arch Dermatol Res 1994;286:434–42. Ackerman AB, Ragaz A. Erythema multiforme. Am J Dermatopathol1985;7:133–9. Prendiville J. Stevens-Johnson syndrome and toxic epidermal necrolysis. Adv Dermatol2002;18:151–73. Wolverton SE. Update on cutaneous drug reactions. Adv Dermatol1997;13:65–84. 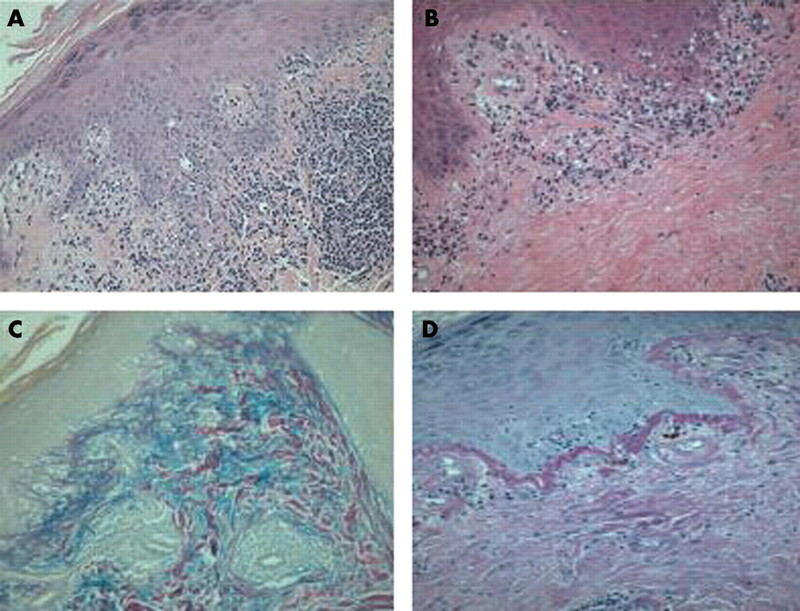 Costner MI, Jacobe H. Dermatopathology of connective tissue disease. Adv Dermatol2000;16:323–59. Crowson AN, Magro C. The cutaneous pathology of lupus erythematosus: a review. J Cutan Pathol2001;28:1–23. Sotheimer RD. Cutaneous features of classic dermatomyositis and amyopathic dermatomyositis. Curr Opin Rheumatol1999;11:475–82. Aractingi S, Chosidow O. Cutaneous graft-versus-host disease. Arch Dermatol1998;134:602–12. Shai A, Halevy S. Lichen planus and lichen-planus like eruptions: pathogenesis and associated diseases. Int J Dermatol1992;31:379–84. Prieto VG, Casal M, McNutt NS. Lichen planus-like keratosis. A clinical and histological reexamination. Am J Surg Pathol1993;17:259–63. Andrews ML, Robertson I, Weedon D. Cutaneous manifestations of chronic graft-versus-host disease. Australas J Dermatol1997;38:53–62 quiz 63–4. Arizaga AT, Gaughan MD, Bang RH. Generalized lichen nitidus. Clin Exp Dermatol2002;27:115–17. Weyers W, Weyers I, Bonczkowitz M, et al. Lichen amyloidosus: a consequence of scratching. J Am Acad Dermatol 1997;37:923–8. Romani J, Puig L, Fernandez-Figueras MT, et al. Pityriasis lichenoides in children: clinicopathologic review of 22 patients. Pediatr Dermatol 1998;15:1–6. Patel DG, Kihiczak G, Schwartz RA, et al. Pityriasis lichenoides. Cutis 2000;65:17–20, 23. Rico MJ, Kory WP, Gould EW, et al. Interface dermatitis in patients with the acquired immunodeficiency syndrome. J Acad Dermatol 1987;16:1209–18. Dalton JA, Yag-Howard C, Messina JL, et al. Cutaneous T-cell lymphoma. Int J Dermatol 1997;36:801–9. Kazakov DV, Burg G, Kempf W. Clinicopathological spectrum of mycosis fungoides. J Eur Acad Dermatol Venereol2004;18:397–415. Goldman MP, Kaplan RP, Duffy DM. 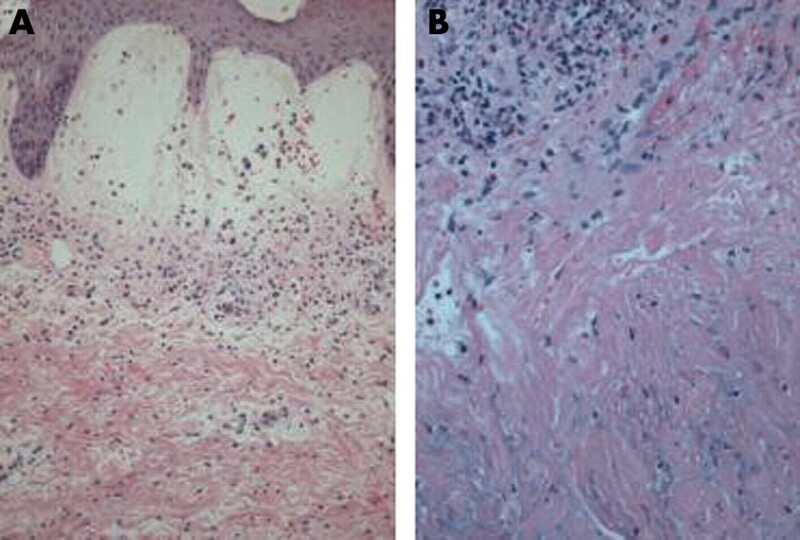 Postsclerotherapy hyperpigmentation: a histologic evaluation. J Dermatol Surg Oncol1987;13:547–50. Nordlund JJ, Abdel-Malek ZA. Mechanisms for post-inflammatory hyperpigmentation and hypopigmentation. Prog Clin Biol Res1988;256:219–36. Barker JN. Pathogenesis of psoriasis. J Dermatol1998;25:778–81. Hendricks WM. Pellagra and pellagralike dermatoses: etiology, differential diagnosis, dermatopathology, and treatment. Semin Dermatol1991;10:282–92. Magro CM, Crowson AN. The clinical and histomorphological features of pityriasis rubra pilaris. A comparative analysis with psoriasis. J Cutan Pathol1997;24:416–24. Albert MR, Mackool BT. Pityriasis rubra pilaris. Int J Dermatol1999;38:1–11. Gonzalez JR, Botet MV, Sanchez JL. The histopathology of acrodermatitis enteropathica. Am J Dermatopathol1982;4:303–11. Morag C, Metzker A. Inflammatory linear verrucous epidermal nevus: report of seven new cases and review of the literature. Pediatr Dermatol1985;3:15–18.